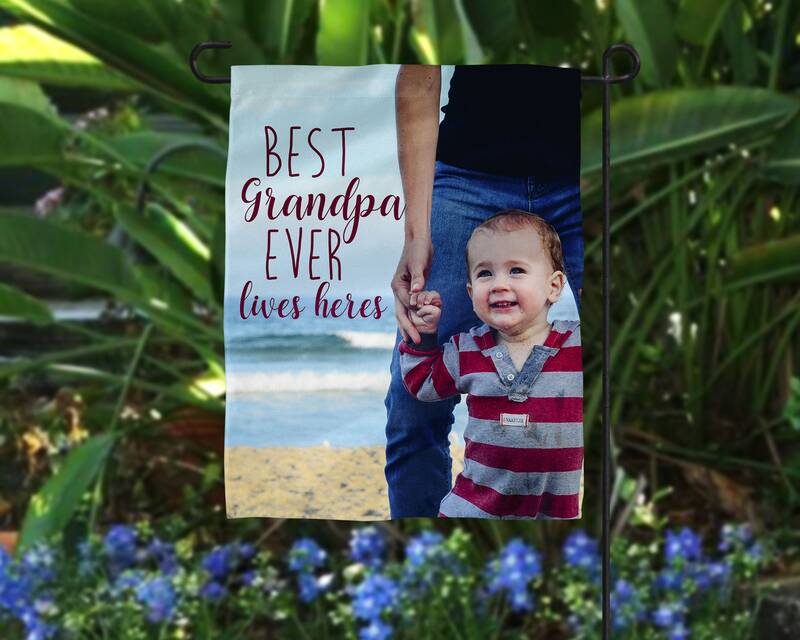 Watch your dad, father-in-law or grandfather light up when they open one of our custom photo flags. These make memorable and heartwarming Father's Day, birthday or Christmas gifts. They'll be talking about it long after you leave! I'm a graphic designer and my dad is a printer and we run our Etsy shop together. We love making custom items like these for families to smile about years down the road. We will print your favorite photo with the phrase shown in the photos (you pick any name/personalization). Or you may choose to have us simply print your treasured photo with no text at all. If you have your own phrase in mind, please send us a message about having us create a custom order. These extremely durable, polyester-blend flags were designed to be outside. They aren't affected by rain, sun or snow. Years later the color will still be retained, and they'll still look beautiful! -This garden flag is 16x10 inches. -It has a sleeve at the top sewn in so it can easily be placed in a stand (not included). If you would prefer there be grommets instead of a sleeve, please message us. If nothing is specified, we will sew in a sleeve at the top. -We use a dye sublimination technique, which means the fabric itself is dyed and will be printed on one side. -We want to make sure your flag prints beautifully, and to help make that happen, please do NOT send us photos that are less than 1 MG. Photos with a low resolution will result in a grainy, blurry flag, and we know you don't want that! -Please send us a message via Etsy with the photo you'd like us to print on the flag. If a photo is not sent at the time of message, this may result in a production delay. -You may have just your photo printed on the flag, or for an additional fee, you can have us print your photo with one of our text options. -When you check out, there will be a box called, "Note to Seller." Please tell us there what name/nickname you'd like us to use for the personalization (fi you've selected that option). -Message us and have a flag made just for you! With the addition of a custom design charge, we can make a collage of photos on your flag. 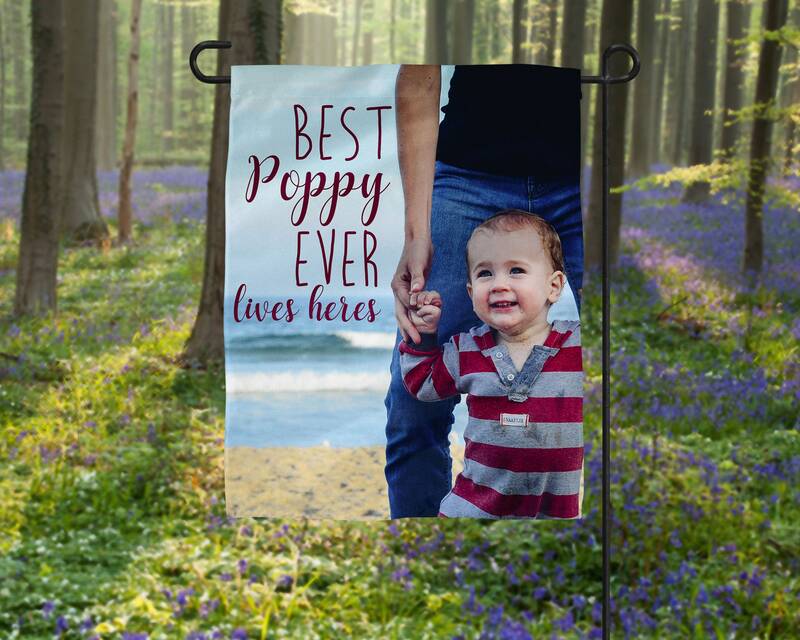 -These are fabulous gifts for grandparents with a photo of their grandchildren or for new parents with a photo of their new bundle of joy. They are also perfect for birthday parties, graduation parties, wedding and bridal showers and anniversary parties.